Titan Aerospace, drone maker, bought by Google. 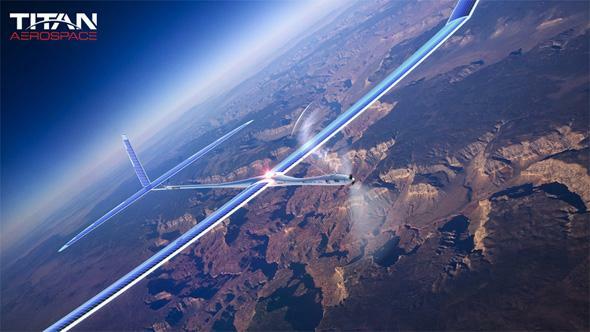 Google is taking to the skies. Google has been on a months-long shopping spree, purchasing companies like military robot maker Boston Dynamics and smart-home device manufacturer Nest. And now the Wall Street Journal is reporting that Google just acquired high-altitude drone manufacturer Titan Aerospace. The cost is unknown. The company, which is based in New Mexico and will remain there, makes solar-powered vehicles that are meant to fly for years at a time. It has about 20 employees and is run by Vern Raburn, who formerly worked at Symantec and Microsoft. The plan is for Titan Aerospace to work on Google’s worldwide Internet coverage initiative, Project Loon, and potentially do imaging for Google Maps. “It’s still early days, but atmospheric satellites could help bring internet access to millions of people, and help solve other problems, including disaster relief and environmental damage like deforestation,” a Google spokesperson said in a statement to the Wall Street Journal. The announcement comes a few weeks after Facebook announced the acquisition of drone manufacturer Ascenta. Facebook bought the company for $20 million and plans to use it as part of the Internet.org initiative—which is the social network’s planned worldwide Internet service. Facebook also originally considered buying Titan Aerospace. Google’s purchase will help in its ongoing acquisitions war with Facebook, but it seems to work with the direction many of the company’s plans were going in anyway. For instance, drones will help with things like deploying sensors for data collection. Plus, with Amazon researching drones, why wouldn’t Google want its own vehicles in the sky? Titan Aerospace plans to begin operations beyond the planning stage in 2015, and it could be a few years after that before Google services start to change in any significant way because of the drones. But while everything looks normal on the ground just remember that Google-branded aerial vehicles are going to be gliding above.